10mm Twinwall Corotherm is a light weight, impact resistant polycarbonate roofing and glazing sheet available in clear and bronze. Available in full sheets and cut to size. It is guaranteed for 10 years. Refer to the Corotherm installation guide and installation video for complete installation instructions. Corotherm can be easily cut and will not crack or shatter. When cutting parallel to the flutes a sharp knife can be used but when cutting across the flutes a fine toothed saw is required. For cutting curves use a fine toothed jig saw. 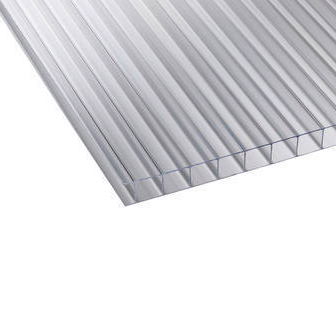 When installing Corotherm sheet it is important to allow a sufficient expansion gap at the top end of the sheet. When drilling fixing holes an expansion allowance of 3mm around all fixings is required. Do not fix or clamp sheets too tighly - leave room for thermal movement. Corotherm can be easily and quickly washed with luke warm soapy water and a soft cloth or sponge. Do not use brushes or sharp objects and avoid any abrasives or cleaners of high alkaline nature. This product is covered by a 10 year warranty. A replacement is provided free of charge if the product has failed due to a manufacturing defect, in normal climatic conditions within a 10 year period from the date of purchase. Corotherm MUST be fixed and maintained in accordance with the manufacturer's instructions for the warranty to remain valid: re-erections or consequential damage costs are not included.